Neurofeedback is an accepted counseling intervention used to treat various conditions of the brain including ADHD, anxiety, and depression to name a few. Many athletes and professionals use neurofeedback for peak performance training to improve brain functioning and to give individuals a competitive edge. It is a simple but powerful therapy and often highly effective. Neurofeedback can be compared to piano lessons. Consistent practice leads to lasting change. Most clients need anywhere between 10 and 40 sessions. We primarily use Zscore training with Brainmaster equipment. 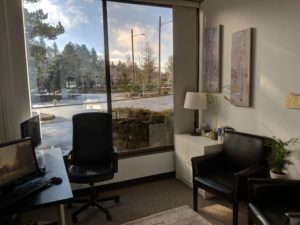 In addition to our experience and training with neurofeedback, ongoing mentoring sessions with an expert in the field are utilized to match the client with the best protocols. We’re proud to provide customized neurofeedback for each of our clients and actively work towards client goals and health. Neurofeedback can be used in conjunction with mental health counseling to help individuals work towards a balanced and healthy brain. Clients report progress towards goals which have included increased ability to manage stress, increased ability to sleep, ability to focus and slow down, clearer thinking, and many other desired results. Practically, neurofeedback at our office is done with a client watching a video or listening to a song while their brain activity is monitored with computer software. This type of neurofeedback is customized to the clients needs. Client participation is important in working towards healthy practices throughout the week in between counseling sessions. This may include deep breathing (HRV training), journaling, healthy diet and cognitive interventions such as practicing thankfulness.